"Where does salt come from?" It was a passing question from ones youth that flew by a conversation as I traveled the Philippines. 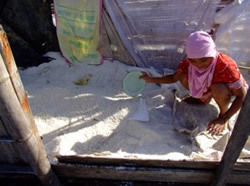 "They make salt along the beach"
I tried to get more information from my Filipino friends with a gasp of curiosity. But my pleas were met with frowns of boredom. It was nothing special to them. But to me I'd never seen salt being made from the sea naturally. 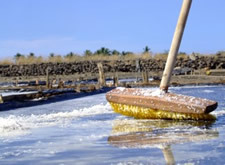 This was my opportunity to find out how sea salt is made. In the small town of Bay Bay in Mindanao, just past El Salvador I arrived via jeepney and with a 5 peso old beat up tricycle bounced along the dirt road to an open dry field. There was a small lake in the distance, and further still a tree line that hid the sea shore from view. Directly in front of me was a dry dirt field with row upon row of little rectangles. A gray white frosting appearing on some as a dozen or so men swept the rectangles with long floor brushes. As I got closer I could see that the rectangles were in fact polythene sacks stretched out into 20 foot by 4 foot lengths along the ground. Some had the shimmer of water on them, others the first signs of crystals forming. 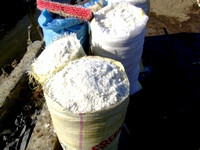 While on some a small pile of white salt had already been swept up to one end. And, all over, the men kept sweeping along these plastic runways. 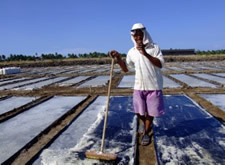 I walked through the field of salt creation under the blazing afternoon sun. A man looked up at me and grinned as he swept a sheen of water along the plastic coating. "Salt!" I stated the obvious bending down to pick through the mans small heap. He stopped for a minute or two. "Yes sir." The man squinted out towards the lake. "There sir. It pumped in from the sea." Apparently once in the lake or rather reservoir, it sits for two weeks. The suns heat helps to evaporate off the sea water and make the remaining sea water dense with salt. 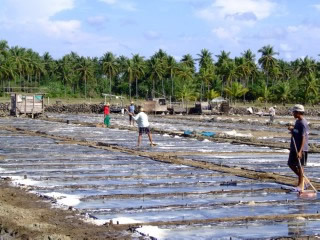 A small channel is then opened up that allows the salty water flow through the field and into the plastic sheets. Then over a 3 hour period in the searing sun the sea water evaporates away. What's left behind are small 1 millimeter crystals of sea salt. 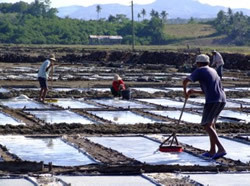 The men sweep the water out over the plastic sheets to help thin it out and thus the evaporation process is excelerated. I walked out to the salt water reservoir. 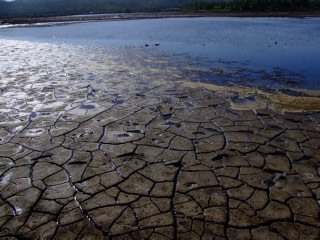 Sun baked mud showed tell tale cracks as slowly the water was channeled away. Somewhat poignantly I noticed some footprints encrusted into the hard ground along salty patches. Up further along another row a young girl was scooping up the piles of salt at the end of each length of plastic. 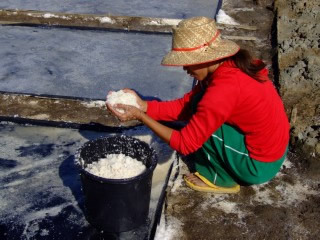 She spoke little english but from what I could rather each sheet produced half a bucket of salt. 3 buckets fill a sack, though it looked like more were needed to fill the 40 KG sacks. Each sack was sold for 100 pesos, or 1.5 dollars. As I departed I came across the gathering point for the buckets of salt. An old wood shed where another young girl lay sweeping up the salt with her hands. The man appeared again and beamed at me with a bright smile. They weren't accustomed to visitors, let alone people who showed an interest in what they were doing. He mentioned that once the salt was stocked up, they sold it and it would go off for iodizing before being sold to the wholesale market. I held out a small salt sachet from the Filipino fast food restaurant Jollibee. The man laughed and point to a sack of nearby salt.